Comic Book Challenge Day 13: A book you’ve read more than five times. As a kid growing up this was one of the first comics that got me into reading comics on a weekly basis and collecting comics. Before Superman #75 I mostly had random promotional comics. 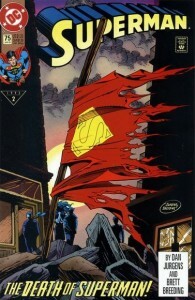 I had known Superman from the movies and various TV shows and cartoon reruns throughout the years. 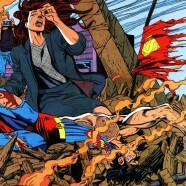 The idea that Superman could die was crazy! I read this comic over and over either out of shock or the sheer insanity of the idea. From this comic I went back and bought all the preceding issues in the story, and all the various Supermen stories that came out of the event.